Mark Moore had always believed he was in charge of his life and he had been doing a good job of it. Mark was the COO, Executive Vice President and owner of Segovia, Inc., which provided global IP services to the Department of Defense. He had over 30 years of operational and financial experience where he oversaw engineering, operations, and finance. During his career he helped raise $2 billion in public and private capital. He was also an involved father, a dedicated amateur athlete and active in his local church. He thought he was in control Monday through Saturday and God was in control on Sundays. All that changed on a Saturday morning in May 2007. It was the day before Mother’s Day and Mark and his teenage son were shopping for a Mother’s Day card. At age 46, Mark suddenly felt weak and he knew something wasn’t right. He called his wife and was rushed to the hospital. He had suffered a stroke. Then, he had a second one two days later. He fell asleep and woke up. “The first thing I remember were words my mother had said to me many years before, ‘God never gives you more than you can handle,’ which is based on 1 Corinthians 10:13,” said Mark. He hadn’t thought of that saying in 30 years. For the first time in his life, Mark surrendered. “It was a foreign experience, but it felt good. In time, I started to see God’s hand at work and I knew He had indeed sent me this storm. 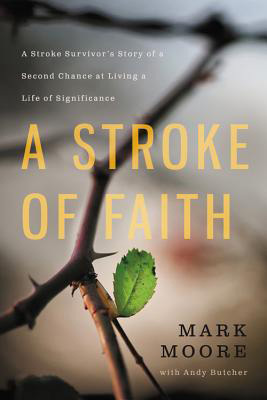 I later realized that I needed a stroke of faith, a chance to surrender and seek His face and since I was too busy building treasures that rust and fade, He had to shake me up,” said Mark. Recovery was a long slow, hard process as Mark had to learn how to tie his shoes, how to write a check and even walk again. “It was really a challenge to my faith but each time God came through and reminded me he is faithful to his promises,” said Mark. A year after the strokes, Mark completed a 5k run and soon returned to Segovia to work. It was eventually sold in 2010, and Mark retired in 2012. He and and his wife, Brenda, are very involved in their Baptist church-mentoring teens and going on missions trips. They made a very large donation to the Mt. Vernon Hospital where Mark recovered and have their names on the Mark and Brenda Moore Patient Tower. They have also established the Mark and Brenda Moore and Family Foundation, which supports advances in healthcare, education, culture and the arts, and Christian evangelism.